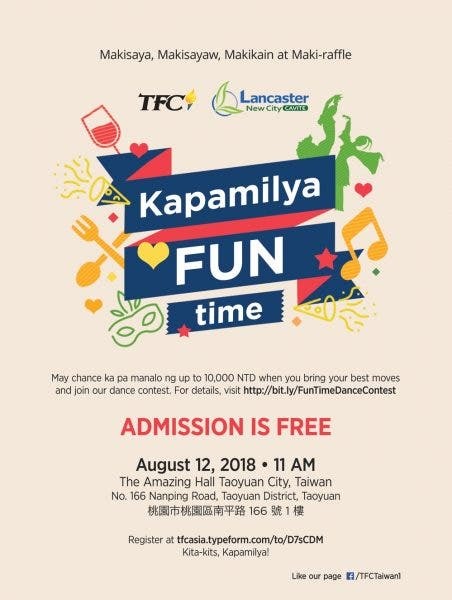 Get ready to witness how the overseas Filipinos in Taiwan will bring the house down with their talent as The Filipino Channel (TFC) and Lancaster New City by Profriends bring the “Kapamilya FUN Time in Taiwan” event happening on August 12 at The Amazing Hall Taoyuan City, Taiwan (No. 166 Nanping Road, Taoyuan District, Taoyuan). The event aims to gather the overseas Filipinos in Taiwan for an afternoon of fun, prizes and great talent, easing their feeling of homesickness. Filipinos are known for exuding excellent talent in different fields. For the “Kapamilya FUN Time in Taiwan”, taking the center stage are overseas Filipinos with a talent in dancing. Dance groups composed of six to twelve members will exude a show-stopping performance, with the winner taking home NTD 10,000 cash prize. With few weeks left, interested dance groups may still submit their audition entries. Simply visit facebook.com/TFCTaiwan1 and click on the “KFT Dance Contest” tab on the left side of the page. Carefully read the rules and mechanics before submitting an audition entry. Who does not love getting prizes? Be one of those who can win exciting ABS-CBN merchandise that will be raffled off at the “Kapamilya FUN Time” event and get a chance to be the lucky winner of a smart phone. If you want to be one of the lucky winners, simply register before the event date by visiting facebook.com/TFCTaiwan1 and click the “KFT Raffle” tab at the left side of the page, fill-out the form and submit. One of the things Filipinos are known for is their love for food. What makes it special is when they can enjoy it for free—which is exactly what they will get from the “Kapamilya FUN Time in Taiwan” event. 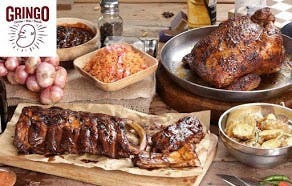 As they enjoy the good entertainment and anticipate exciting prizes, event-goers can create new memories over good food and overflowing drinks. Gather your friends, leave your worries behind and have a good time at “Kapamilya FUN Time in Taiwan” event happening on August 12 at The Amazing Hall Taoyuan City, Taiwan (No. 166 Nanping Road, Taoyuan Distric, Taoyuan). For more updates about the event, visit facebook.com/TFCTaiwan1. Connect with fellow global Kapamilyas and follow @KapamilyaTFC and KapamilyaGlobalPR on Twitter and Instagram.